I’m not one to turn down food. I could be walking home from an 8-course tasting menu in total agony, completely stuffed to the brim, moments away from falling into the street and crawling into the fetal position to cry – when, if someone offered me a free sample of yoghurt or pizza bites or pigs skin – I’d probably take it, just for the experience. With that being said, I couldn’t say “yes” quick enough to an offer of trying some complimentary hot dogs from the hot spot Bull & Bear in River North. Ever since I began a new job in the loop, my walks home have led me into a new foodie scene I never knew existed. And with it being “National Hot Dog Day” & all, I think it’s time we break out the bubbly, head towards Wells & Kinzie and get ourselves some ridiculously tasty hot dogs. Four years ago, Bull & Bear started dedicating an entire week of celebrations to hot dogs, because lets be honest, one day simply isn’t enough. 24 hours is a tease for a holiday if you think about it, just like that ridiculous 7/11 Slurpee Day (I’m still bitter I never got my free coke slushy). The folks over at Bull & Bear are doing some serious celebrating, if your serious celebrations include gourmet hot dogs with insane toppings such as pineapple & cactus relish, salami pepperoncini sausage and dehydrated cilantro (not all together, I promise). From now until the 28th, you can either get the speciality dog of the day for $9 (normal sized dog w/ hearty bun & fries) or you can try two different options; 1 – the “frank plank” (a hot dog flight, if you will, 5 mini versions of the hot dogs listed above) or 2 – the homewrecker, a Chicago-style, 22-inch kosher dog topped with mustard, relish, onion, tomato, sport peppers, celery salt all piled high on a sesame potato bun. I myself, opted for the flight, so I could try them all and judge accordingly! Splitting the minis with a friend, we filled ourselves with the dawgs and a giant order of sweet potato fries, which may have been the greatest decision of my life. 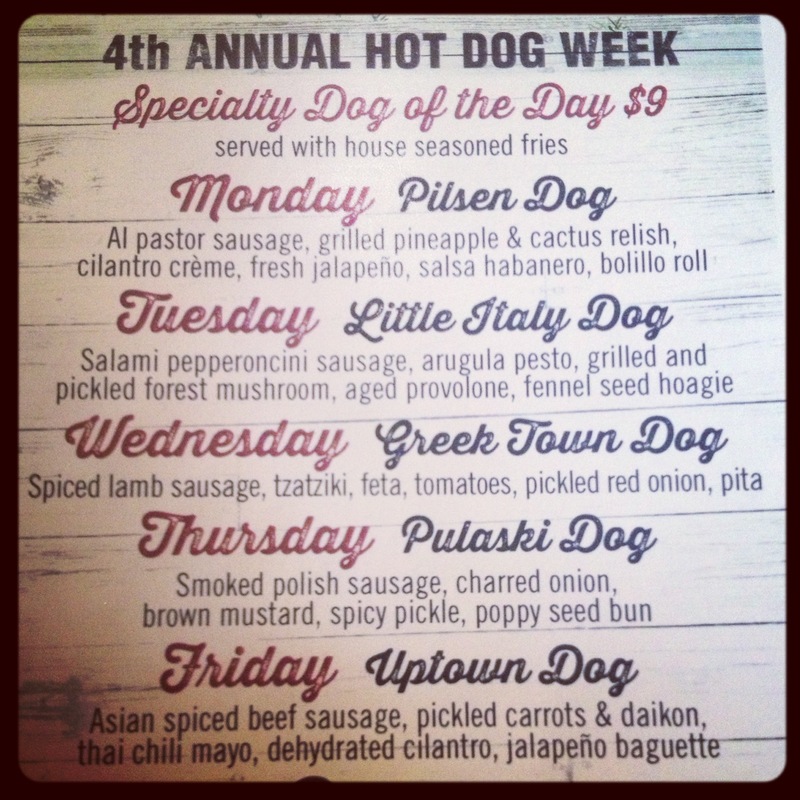 My personal favorite was today’s pick – Tuesday, the little italy dog. The sausage was one of the best I’ve had, smokey and spicy with a nice bite and crunch. The additional toppings truly stood out among the rest – pickled mushrooms, arugula pesto (on a hot dog?!) with aged provolone. Mmmm, after tasting that bad boy, I wished we had about 10 more minis. What can I say? The body wants what the body wants! As a hot dog fiend, I thoroughly enjoyed each mini. My least favorite was Friday’s pick (uptown dog) only because I found it slightly spicier than the rest. However, if you’re a fan of ’em hot – you’ll probably love it! Overall, I think what Bull & Bear is doing this week is fabulous – and given the location of the restaurant, happy hour prices, high energy and fun vibe (and yes, wonderful service), I can’t think of any other place I’d rather hang at this week. 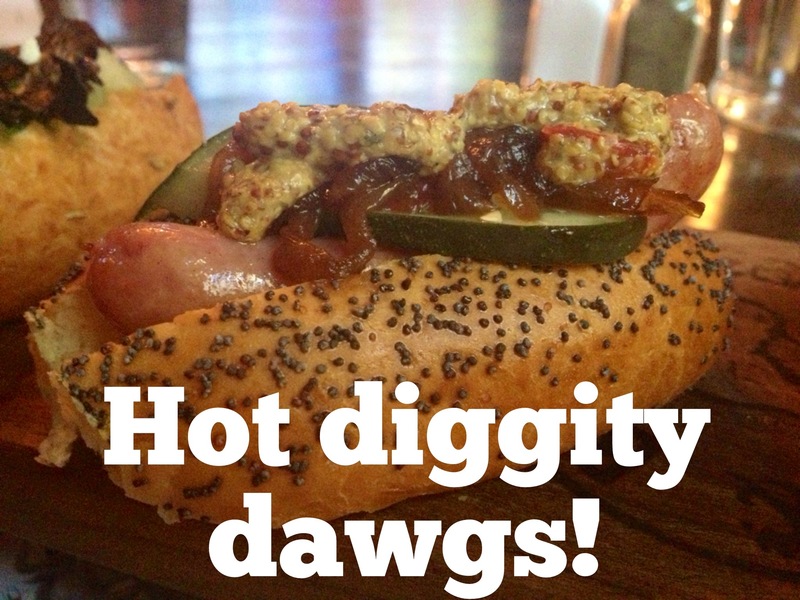 And if you like hot dogs, you really have to check it out. 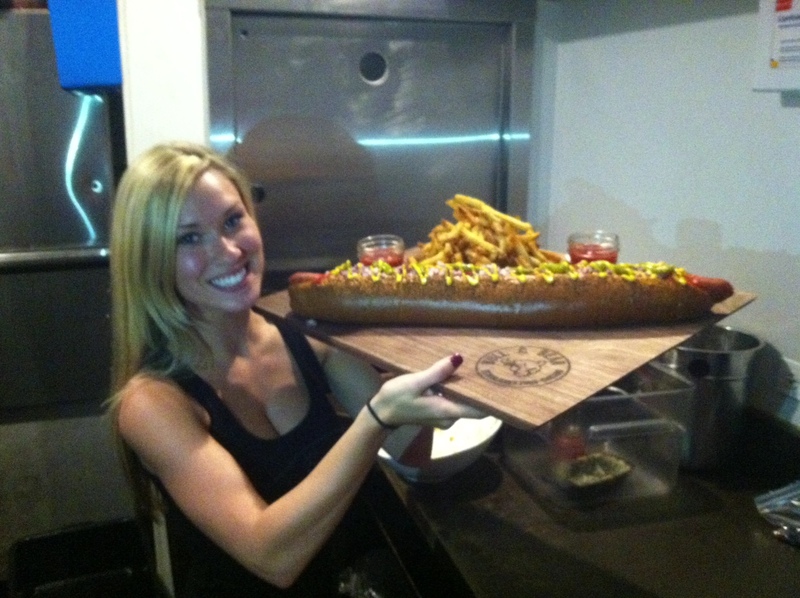 And if you’re really hungry, brave and a fan of competitive eating, you have to try the Homewrecker. If you yourself finish the 22-inch sausage in one sitting, you get a $25 gift card & Homewrecker Chamption t-shirt compliments from B & B. I saw one dude order the monstrosity and oh-my-god, it was so awesome. Order it – then tweet me and tell me it goes. I’m SO curious. 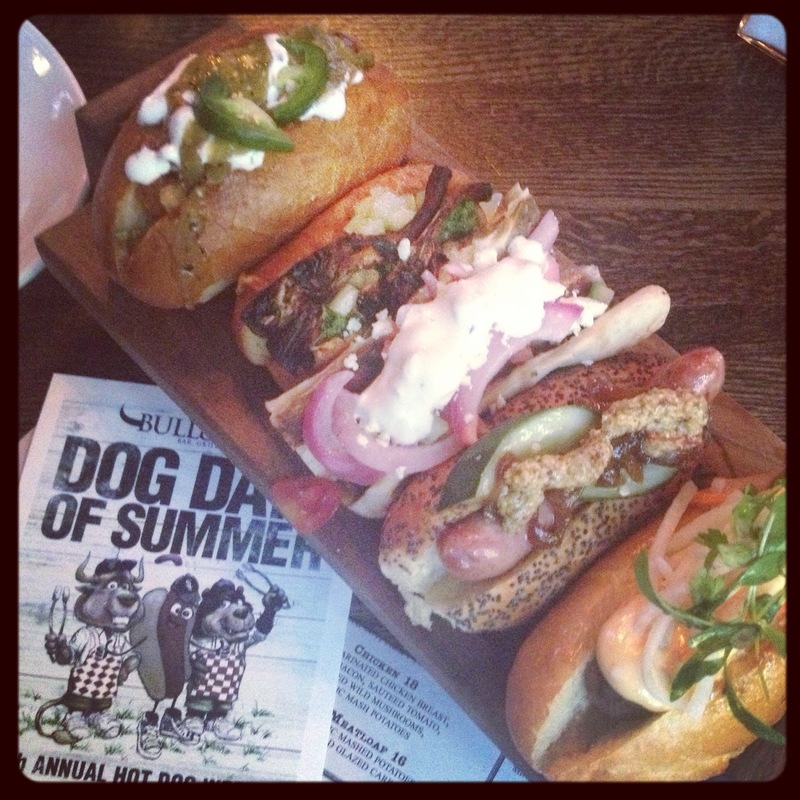 And if you do swing by Bull & Bear this week for dogs, don’t forget to tweet & #RateYourFrank! Big thanks go out to Bull & Bear (and our great server, thank you Chelsea!) for reaching out and for having this awesome little celebration. Again, I will never turn down food. Keep it all comin’ baby, keep it all comin’. Great post, Bytes! If only I lived close enough to meet you for a dog! Thank YOU! Everything was awesome and I’m looking forward to returning very soon for what I know will be yummy food, great service & great happy hour 🙂 woo!